Scientific Facts on The evolution of ozone layer depletion, its impact on climate change, health and the environment. Context - Following the implementation of the ban on CFCs, the ozone layer has been slowly recovering. What is its state and how is it linked to climate change? In the 1970’s it was discovered that every spring, a “hole” was formed in the stratospheric ozone layer in particular over Antarctica, and that some chemicals made by humans were responsible of the destruction of ozone. The very low winter temperatures in the Antarctic stratosphere cause polar stratospheric clouds which temporarily prevent “fresh ozone” produced in the tropical region to replace the destroyed ozone. The reduction of the ozone layer changes the UV-radiation reaching the earth surface and this has various impacts on the environment, on health. In 1987, the governments of the world decided, with the Montreal Protocol, to progressively ban the use of ozone-depleting chemicals (or ODCs), a ban made possible by the progressive availability of “ozone-friendly” substitutes. 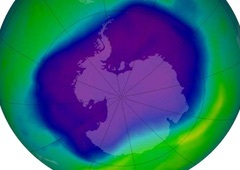 Since then, the seasonal ozone hole has slowly begin to be reduced. What is stratospheric ozone and how is it depleted? Ozone is a specific molecule made of three atoms of oxygen combined which constitute a layer present in small amounts in upper part of the Earth’s atmosphere (stratosphere). It absorbs a large part of the sun’s biologically harmful ultraviolet radiation and, as such, is vital to human well-being and ecosystem health. Some human-made substances containing chlorine or bromine atoms (chloro-fluoro-carbons or CFCs, for instance) which are very stable are persistent long enough in the atmosphere to reach the stratosphere and the ozone layer. Their degradation by cosmic radiation liberates chlorine or bromine atoms that induce the degradation of ozone into oxygen. It is in fact because these substances are very stable and thus do not react to produce harmful effects that they were used in the first place in applications like refrigeration, air conditioning, insulation foams blowing or as propellants in aerosol cans. What is the link between ozone depletion, ozone depletion gases (ODS) and climate change? Radiative forcing, relative to 1750, of all the long-lived greenhouse gases. Ozone depletion itself is not the principal cause of global climate change. Changes in ozone and climate are directly linked because ozone absorbs solar radiation and is also a greenhouse gas. Stratospheric ozone depletion leads to surface cooling, while the observed increases in tropospheric ozone and other greenhouse gases lead to surface warming. Regarding ozone depleting substances (ODS), most are also strong greenhouse gases and, in a world without the Montreal Protocol on ODS ban (minus 98% consumption worldwide between 1986 and 2015) restrictions, annual ODS emissions could be today as important for climate forcing as those of CO2 and be 10-fold larger than its present value1. Transitory ODS substitute gases, H-CFCs first, then HFCs (hydrofluorocarbons) are also greenhouse gases but most of them to a lesser extent and their transitory use as substitutes to ODS represented the most important contribution to the reduction of the global greenhouse gases emissions. Anyway, because these first generations of substitute chemicals had still a significant greenhouse gas potential which could in the long term offset the climate benefit by substantially contributing to human induced climate forcing, their progressive phasing out was decided in 2016 in an amendment of the Montreal Protocol2. Other changes in climate associated with ozone layer depletion include changes to wind patterns, temperature and precipitation across the Southern Hemisphere. More intense winds lead to enhanced wind-driven upwelling of carbon-rich deep water and less uptake of atmospheric CO2 by the Southern Ocean, reducing the oceans potential to act as a carbon sink (less sequestering of carbon). Has ozone depletion significant effects on human health? In spring 2011, an increase of 40-50% in sunburn was observed in several Arctic and Scandinavian locations. However, according to the UNEP report, more that increased UV exposure due to ozone loss, changing behaviour these last decades with regard to sun exposure likely explain it. Excessive UV-B radiation can lead to sunburn but also eye inflammations, cataracts that may lead to blindness and to skin and eye cancers. The incidence of these cancers has risen significantly since the 1960s in fair-skinned populations, but has stabilised in recent years in younger age groups in several countries, perhaps due to effective public health campaigns and in many countries, mortality may have peaked. Meanwhile, it is important to note the role of solar UV radiation in the synthesis of vitamin D which is critical in maintaining the blood calcium levels required for strong bones. Vitamin D deficiency might also increase the risk of an array of diseases such as cancers, autoimmune diseases and infections. It is thus critical to balance the necessity of exposure to UV-light, with its risks. What are the impacts of changes in the ozone layer and UV-B radiation on ecosystems? Plant productivity is likely decreased slightly due to the increased UV radiation and UV-B radiation can affect the interactions between plant roots, microbes, soil animals and neighbouring plants, with potential consequences for soil fertility, carbon storage, plant productivity and species biodiversity. By contrast, exposure to UV-B radiation can promote plant hardiness and enhance their resistance to herbivores and pathogens, improve their quality, and increase or decrease the yields of agricultural and horticultural products. UV radiation of polyphenolics can also increase the nutritional quality of plant products and plant tolerance to stress conditions. UV radiation plays also an essential role in the formation of photochemical smog, which consists mainly of ground-level ozone and particulate matter and aerosols but, conversely, UV radiation may also play a role in the destruction of aerosol particles. On the other hand, the increased frequency and extent of wildfires due to climate change become important sources of atmospheric black carbon and organic carbon smoke particles and aerosols with significant effects on UV radiation of earth surface. In aquatic ecosystems, UV radiation has an effect on the distribution and composition of species and interacts with the fact that oceans are warmer and more acidic. United Nations Environment Programme, Environmental Effects Assessment Panel. The present Progress Report for 2015 is a short report. A full Quadrennial Assessment, more detailed in terms of technical information, will be made available in 2018. A component of the 2014 report of the Montreal Protocol Scientific Assessment Panel, Scientific Assessment of Ozone Depletion. What are the advances that are needed to reduce the cost further and deploy the technology on a larger scale ?